Correction: This story has been updated to clarify remarks made by Phil Lobel. This was one show that won’t be getting an encore. Feyline Presents, an entertainment agency founded by legendary rock promoter Barry Fey and managed by his son, was sued last month by a one-time friend of the Feys for a flopped New Year’s Eve concert. In a complaint filed in El Paso County District Court, investor Jason Huffer accused Feyline’s management of a “conspiracy to defraud and steal their way to over $360,000” of his money last year while organizing a concert at the Red Rocks Amphitheatre. Huffer alleges the concert was a mismanaged and disorganized disaster, ambitious and doomed due to poor planning, expensive tickets and out-of-control finances. He’s suing to get back his $300,000 investment, on top of $60,000 he says was charged to his credit card without his authorization. In the salacious complaint, Huffer claims he was promised a sold-out night, 70 percent of the profits and a 35 percent minimum return on investment for a turnkey event. The suit was filed by lawyer Ian T. Hicks. Eight months after the concert, Huffer said he hasn’t seen a dollar. And he claims he can’t get a meeting with Feyline. Tyler Fey, son of the late Barry Fey and a partner at Feyline, declined to respond to the specifics of the lawsuit. However, he said that no one from the company has been served yet. 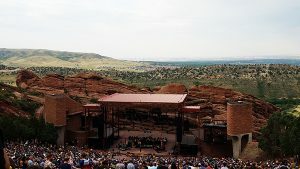 Red Rocks holds 9,500 attendees. Photo by Brendan Pedersen. Barry Fey was an icon of the music industry in Denver until his death in 2013. Famous for bringing Led Zeppelin to Colorado for their first American show and pulling off the last Jimi Hendrix concert, many in the industry credit the promoter with creating the city’s music scene. Huffer’s name appeared in a handful of promotional materials ahead of the concert. In a press release from November, he was introduced as a partner of Tyler Fey, who took over Feyline from his father after his death in 2013. Huffer claimed that Feyline was wildly unprepared to pull off the event and misled him about financial pledges to other investors. According to the complaint, while Huffer had been promised 70 percent of the event’s profits, Feyline also had promised other groups equity stakes — 40 percent to Denver concert venue Cervantes Masterpiece Ballroom, and 66.6 percent to Papillon Pavilion Records LLC. Representatives from Cervantes Masterpiece declined to comment. Jordan Crudo, owner of Papillon Pavilion Records, could not be reached for comment. 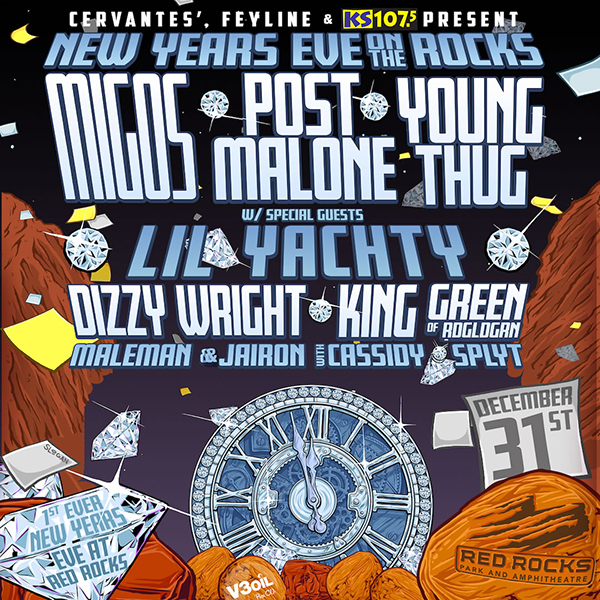 The concert, billed as “New Year’s Eve On The Rocks” and featuring music acts Young Thug, Post Malone and Migos, was a risk from the start. Organizers hailed the Red Rocks show as the first in history to take place on New Year’s Eve. But an outdoor show in winter was a big risk. Weather already had thwarted one other Feyline production. In the fall, it planned an event called the Island of Light, a three-day electronic music festival in Puerto Rico. It was cancelled in the wake of Hurricane Maria, which decimated the island. 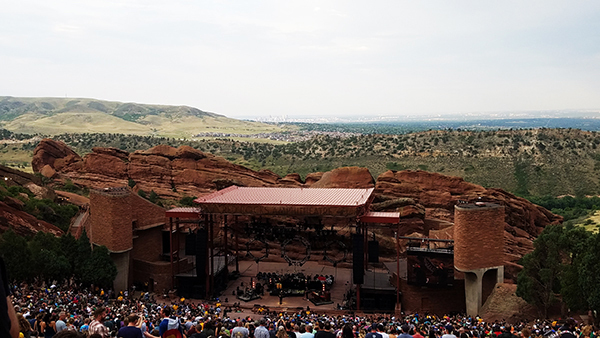 In the weeks leading up to the Red Rocks show, Tyler repeatedly expressed concerns to news media about the unpredictable winter weather up and around the Rocky Mountains — 50 degrees and sunny one day, 28 degrees with icy rain the next. Phil Lobel, founder of Lobeline Communications Inc. and a former concert promoter himself, helped market the show in the months before the concert. In a Tuesday interview, Lobel — who worked with Barry Fey in the 1970s and ’80s — said he had known Tyler all his life when he agreed to help promote the concert at Red Rocks. Eventually, Feyline bailed on Red Rocks. The group had booked a backup venue at the University of Denver’s Magness Arena, and on Dec. 22 – three days before Christmas and just over a week before the show – announced it would be moving the concert indoors. While Red Rocks can fit 9,500 people into its outdoor amphitheater, Magness has 2,000 fewer seats. According to the University of Denver, 5,012 people attended the show. Justin Moss, another former colleague of Barry Fey and founder of The Pineapple Agency in Denver, worked briefly with Feyline to find corporate sponsors for the concert. Huffer could not be reached for comment. Moss said that the run-up to the concert was chaotic, but he added that chaos was the nature of the music industry.